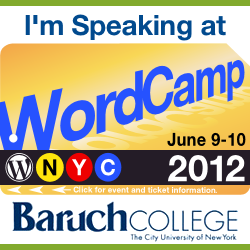 I am excited to announce that Jake, Helen, and I will be speaking at WordCamp NYC 2012 – which we’re also sponsoring – on June 9-10. This will be my first time to speak at a WordCamp. Jake and Helen are old pros. In Jake’s presentation, he will be asking: “What would core do?”, and challenging you to keep asking yourself the same as you add your themes and plugins to WordPress. He will show you how to extend core “with class and consistency”. If you are in the New York area, come see us. We would look forward to meeting you (or seeing you again).